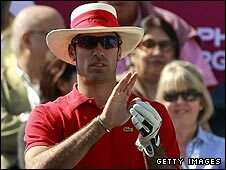 Spaniard Alvaro Quiros won the Qatar Masters by three shots ahead of Sweden's Henrik Stenson and South Africa's Louis Oosthuizen. Quiros fired a three-under 69 in the final round for an aggregate score of 19 under 269, earning him his third European Tour title. Stenson (68) and Oosthuizen (71) shared second place on 16 under. England's Simon Dyson and Scot Andrew Coltart finished with world number two Sergio Garcia in seventh on 11 under. Quiros becomes the first Spaniard to win in Qatar in the 12 editions of the tournament since it began in 1998. The 26-year-old's victory puts him into the world's top 30 to virtually guarantee his debut at the Masters at Augusta in April. After a shaky start, Alvaro had five birdies on the back nine, including two straight on the 16th and 17th holes. "It feels great," he said. "After being in the lead at the end of the third round, it all boiled down to making fewer mistakes on the final day. "It wasn't a perfect day, though. I took time to get going. It is a surprise to win here. Winning is not easy. "Now I will be, maybe, in the top 30. That is important for me. It is important for me to play big tournaments." Ireland's Damien McGrane was fourth on 13 under with Spaniard Miguel Angel Jimenez and Dutchman Maarten Lafeber one shot behind.